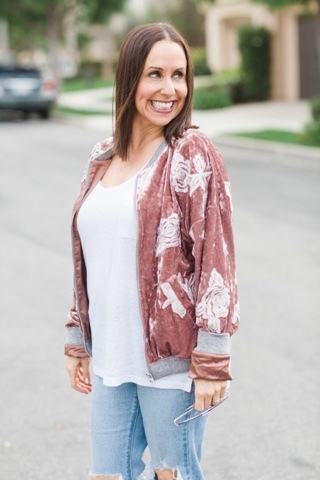 Spring is on it's way and found the cutest spring bomber jacket at the online boutique-- www.HauteShopCo.com. You must check it out. I mean a blush velvet bomber jacket? Um yes please. Bomber jackets are still so on trend for spring. Every fashion girl needs one!! I decided to pair this cute version with a white tee, some boyfriend jeans and tennies. I kept it casual and fun. This is the perfect look for a day of errands or a casual movie night with my hubby. What do you think of the velvet bomber? Let me know in the comments.. Thanks to Taylor Cole for photos and Happy Reading!! !